Canon, the king of compacts and prosumers, has turned up fashionable late to the mirrorless interchangeable lens camera (MIRC) party. This new class of camera promises DSLR quality in a compact's body, which is like fitting all the computing power of an Apollo moonshot into a tiny cellphone. And we've already managed that. 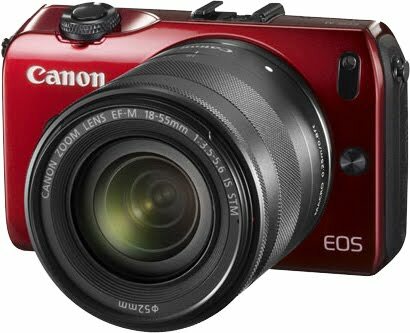 The Canon EOS M is virtually a small, mirrorless version of the new EOS 650D, with the same sensor, a simplified version of the 650D's touch interface, bringing DSLR results within each of clueless newbies who've learned their photography skills on instagram rather than actual cameras. The other functions are accessed via the 3in/7.6cm multi-touchscreen. Like a smartphone. Serious shooters may shudder but the screen and interface are fast and intuitive enough for all but the "full manual control" diehards. Pinch to zoom, swipe to scroll, touch to focus and shoot. There's an 18MP APS-C CMOS sensor in there, capable of shooting up to ISO 25,600 equivalent, with Canon's DIGIC 5 processing. The same package - and the same image quality - you'll find in the new 650 DSLR. Where have all the knobs and dials gone? This looks more like an lxus than and EOS. Canon's familiar 4-way control dial has been stripped down to offer drive mode, auto-exposure lock, exposure compensation, and a Delete key that's customisable for shooting mode. Meet Canon's new EF-M lens mount. All your current Canon EOS and EF-S lenses will plug in via an adapter, and two new lenses have been launched for the EOS M: an 18-55mm f/3.5-5.6 IS STM zoom, and a 22mm f/2 STM 'pancake'. More EF-M lenses to follow, apparently. Mirrorless, compact, powerful, easy to operate. Welcome to the future, Canon fans.